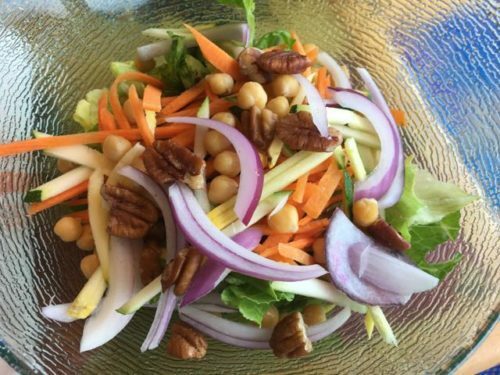 When I agreed to go on a cruise with my dad, a primary concern was what I would eat during 16 days on a floating hotel known for excesses of rich and decidedly non-vegan food. 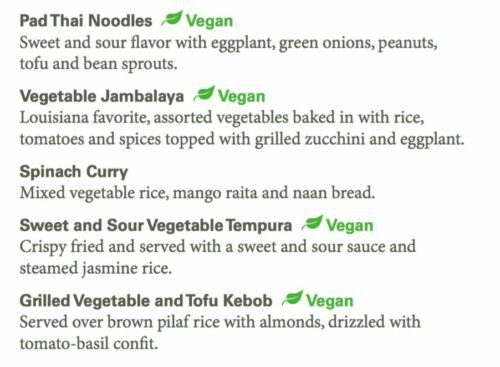 A little research told me that I was in luck: my dad had chosen a cruise on Holland America, which is considered one of the more vegan-friendly cruise lines (here is their full vegetarian menu). I made sure Holland America knew in advance that I’m vegan, and they told me there was no problem—just let the staff know on the first day of the cruise. Kitchen tour on the MS Amsterdam. Look away, vegans! There’s not much for you here! I’d been on three cruises before. The two big-ship cruises were on NCL, and they were very accommodating with several vegan options. I just had to let them know in the morning what I wanted for dinner that night. I got tired of pasta and stir frys, but overall they did a good job, and I could always find something for breakfast and lunch. I also took a river cruise on Viking, and their vegan options were the best of the lot. Back to the current cruise. I made our first-night dinner reservations and again told them I was vegan. No problem, just let our server know. We arrived for dinner and asked what was available. Oh, in the main dining room you need to pre-order from our vegetarian menu. And how was I to know that? I got the first of many “you should have asked us…” responses on the ship. They put together a meal for me, which was pretty good, and I preordered for the next night. Maybe I’ve just become picky now that I know how easy it is to make great, healthy vegan meals, but I was quite disappointed in the food on this cruise. The four vegan entrees on the menu were underwhelming. The only highlight of the menu was an Asian noodle soup made with coconut milk: delicious, but very rich. The tempura vegetables were good, but greasy. Tofu and vegetable kabobs with tomato sauce were boring to say the least, and the veggie jambalaya was so dull I never ordered it again.Things are more flexible at the buffet restaurant, but you have to walk by a lot of other stuff to find the vegan options. They’re not obvious, and often the staff has no idea what vegan means. One of the few days they had roasted potatoes for breakfast. Breakfast had an okay selection of under-ripe fruit, and there was always oatmeal and a selection of non-dairy milks (soy, almond, and rice). I ate a lot of whole wheat bread with Vegemite on this ship. Well, they had something called veggie links, which are supposedly vegan sausage. I tried one. No thanks. Some days they had roasted potatoes, but most of the time the potatoes were greasy hash browns. 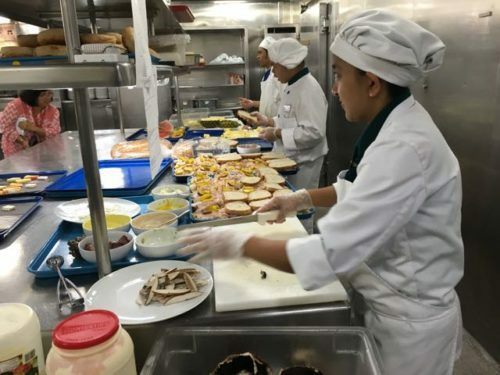 The saving grace of the meals on the ship was the salad bar. For health reasons you can’t make your own salad: you tell the salad maker what you want in it. My constant refrain was “more greens please” and “more garbanzos please.” At lunch time, the highlights were the salad bar and the taco bar (yay, rice and beans! ), and a couple of times they had vegan sushi. 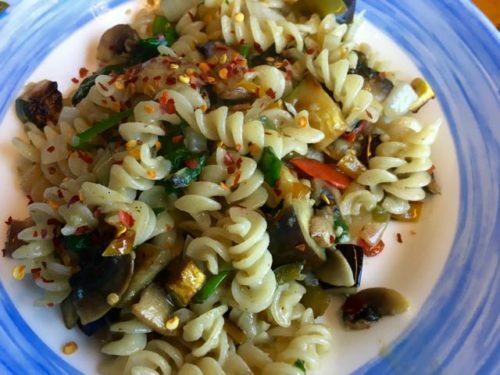 The pasta bar was pretty good, but heavy on the oil and limited veg toppings. The occasional vegetable curries were all made with milk. Fortunately, I don’t have much of a sweet tooth. Every day I walked past rows and rows of dairy-based desserts. In the main dining room, the only vegan dessert was sickeningly sweet sorbet. 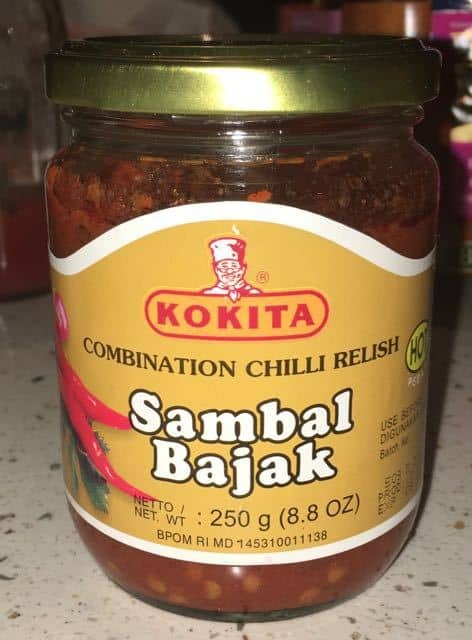 Samabl saved the bland food over and over! 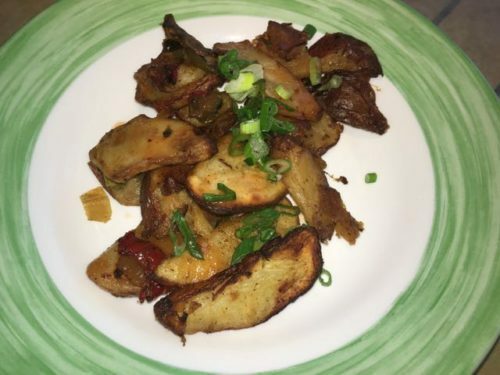 The two biggest problem with the food on the cruise were that it was bland and I couldn’t get more than a tiny dish of vegetables without oil. My omni roommate had the same complaint about the food being bland, so it’s not just the vegan options. Thank heavens for Sambar chili relish—it’s the only spice most of my meals have had. I ordered the vegan sushi as much as possible because the wasabi and ginger are the only sources of bold flavor in the meal. One night I didn’t pre-order at the main dining room. When I went to pre-order the next day, I was told that I’d missed the deadline: preorders need to be in by 10am. How would I know that? You should have asked us, ma’am. The officer in charge of the dining room told me he’d check with the chef, who did allow me to put in my order. At this point I was really tired greasy meals, and asked whether I could just get some rice and steamed vegetable. “Of course, ma’am. Anything is possible on this ship.” Okay, I was told I had to order from the vegetarian menu. Good to know there’s some flexibility. I ordered rice and vegetables a couple times but found I had to be very specific about asking for green vegetables, or I got a big plate of steamed carrots. One night I got a pile of green beans and—I kid you not—one broccoli floret. Another night I asked for broccoli and instead got a tiny bit of chopped squash. Bland veggies and white rice aren’t my favorite, but they were a welcome alternative to the greasy choices on the vegan menu. The best meal I had was not in the main dining room, but a made-to-order pasta dish in the buffet restaurant (they even had rice pasta!). Cruise ships are an environment of excess. Everyone needs some excess, but I saw little interest in healthy options among either the guests or the kitchen staff. However, with some persistence and by lowering my standards, I did maintain my vegan diet. I have to say, it was not a very pleasant experience to eat like that for 16 days. I’d have stayed with the buffet too if I hadn’t been traveling with three omnivores :-). Thanks for sharing your experience. 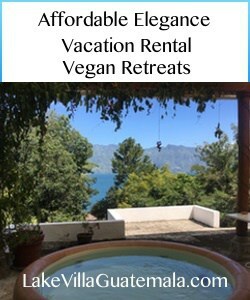 I host vegan retreats at Lake Atitlan and can help you plan your next trip to Guatemala. https://lakevillaguatemala.com.